Blue is one of those colors that instantly brightens any space and is the perfect shade for summer. Do you ever get excited by the thought of what using your favorite color to decorate with can do for yourself and your home? Maybe you think it’s silly, but I do! I love surrounding myself (without going overboard) with my favorite color. There’s just something cheery to me about about sprinkling it throughout my home. If you’re looking for the perfect color to brighten your home this summer, I highly recommend decorative accents in shades of blue! It’s the color of the water and the sky and cool refreshing swimming pools. 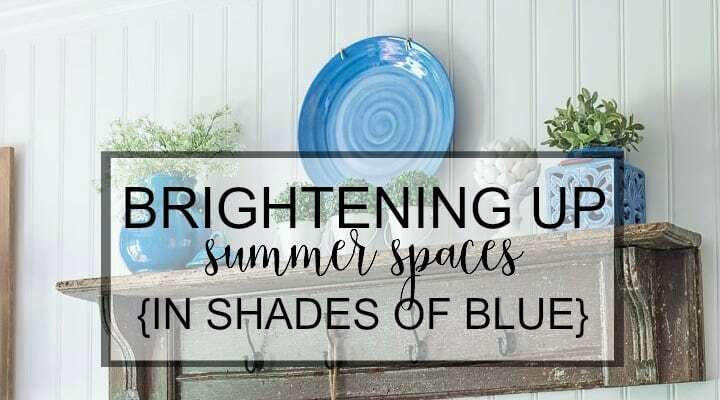 From Carolina blue to iris, royal blue and navy to turquoise – get ready to brighten your summer spaces with this ever-popular color with these pointers. Grab some bowls, plates and silverware in solids and prints, then mix and match them into a colorful place setting. Oh, and tie a bit of twine around silverware for a unique look. The dollar store is fantastic resource for inexpensive dishware! 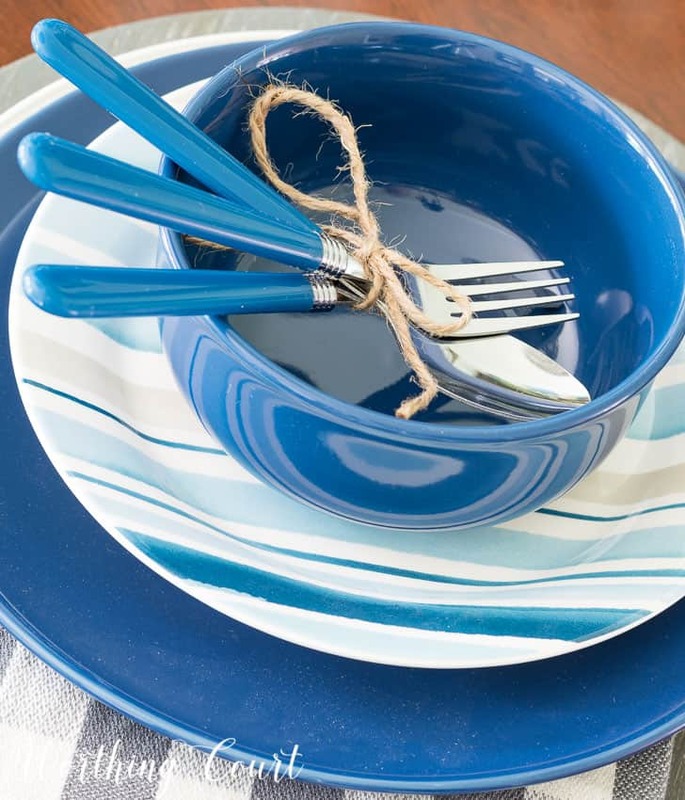 This place setting consists of my diy driftwood-look charger topped with one of my everyday white plates, a blue dollar store plate, a beachy striped plate found on clearance and a blue dollar store bowl. I found a whole set of blue handled silverware at HomeGoods for less than $15. You don’t have to spend a ton of money to set a pretty summer table! In my mind, you can’t talk about decorating without talking about pillows. 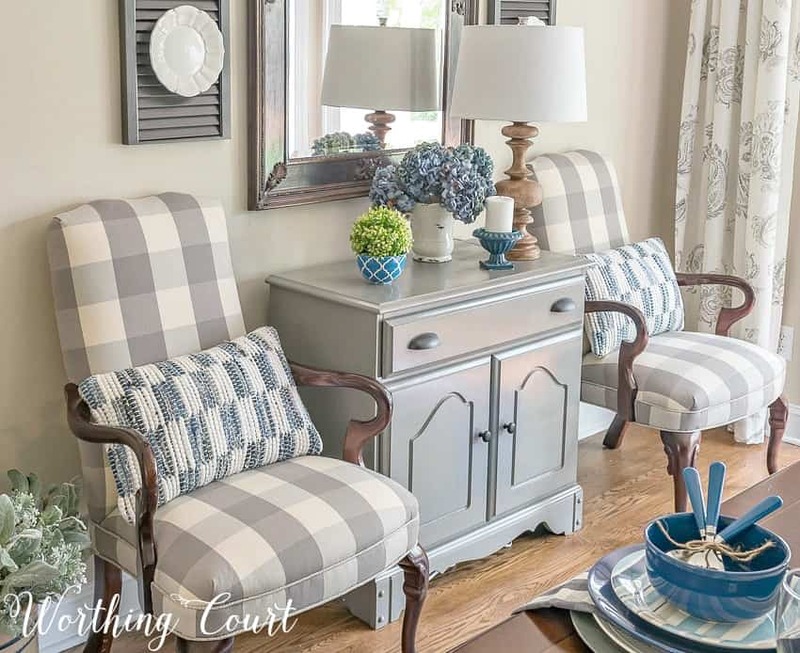 😀 Y’all know that I love to mix patterns, so the large solid square pillow in cornflower, next to a small pinstriped navy and white pillow on top of the diy buffalo check upholstered bench is my jam. 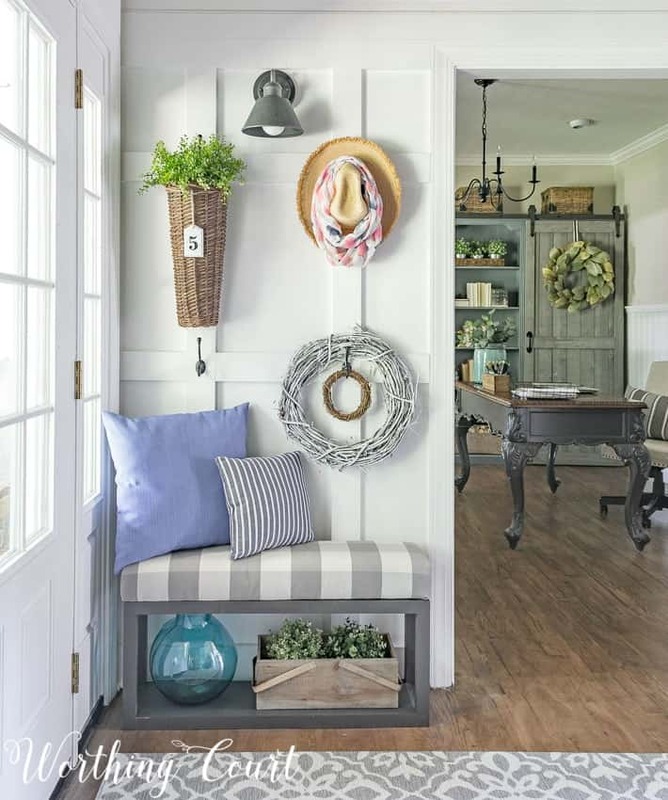 When combined with other colorful elements like the turquoise glass vase, you’ve got a perfect summery spot in your home! I love incorporating fresh and faux flowers into my rooms, especially in the summer. Everything is blooming outdoors this time of year, so why not bring the outdoors in? These dried hydrangeas add a hard-to-miss pop of blue while greenery in a patterned blue bowl and a navy mini urn turned candle holder round out a simple vignette in the dining room. There’s more pattern mixing going on with the navy and white pillows and don’t miss that place setting that I talked about earlier. This tall blue ombrè ceramic pitcher is large and makes quite the summer statement piece on my mantel. I have yet to find a spot in our home it doesn’t liven up. When it comes to containers, think outside of the box for filler. You don’t have to always use foliage stems of some sort. I think my salvaged spindles make a great “bouquet”! Have you ever taken the time to really explore the ribbon options at your fave store? If you haven’t, you NEED to – the choices are endless! 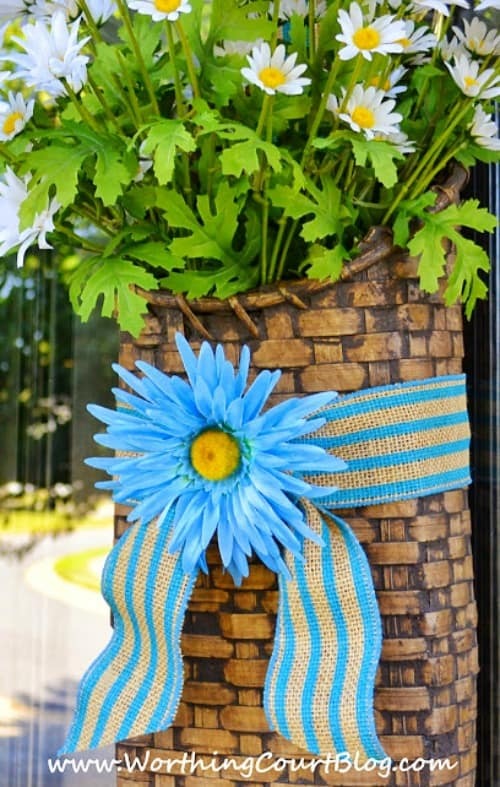 Adding blue striped burlap ribbon to this door basket gives it a bright pop that makes my front door more noticeable from the street. 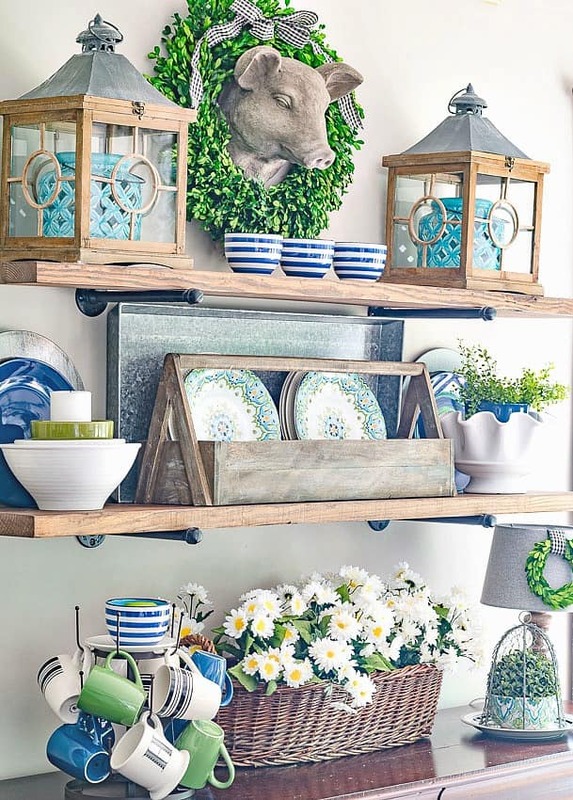 There’s hardly a shade of blue that I didn’t incorporate into these shelves in my breakfast nook! Repeating the various shades over and over causes the shade mixing to look intentional instead of “I just didn’t have anything else to use”. And who says you can’t put a lantern inside another lantern? Not me because I actually love this crazy idea that came to me when I was trying to think of a creative way to decorate the shelves for the summer. Needless to say, blue is a color that can be brought into your home this summer with countless shades in numerous ways. Decorating should be fun, not a chore! So, no matter what blue you choose, have fun with it and mix and match without fear of breaking any set design rules. 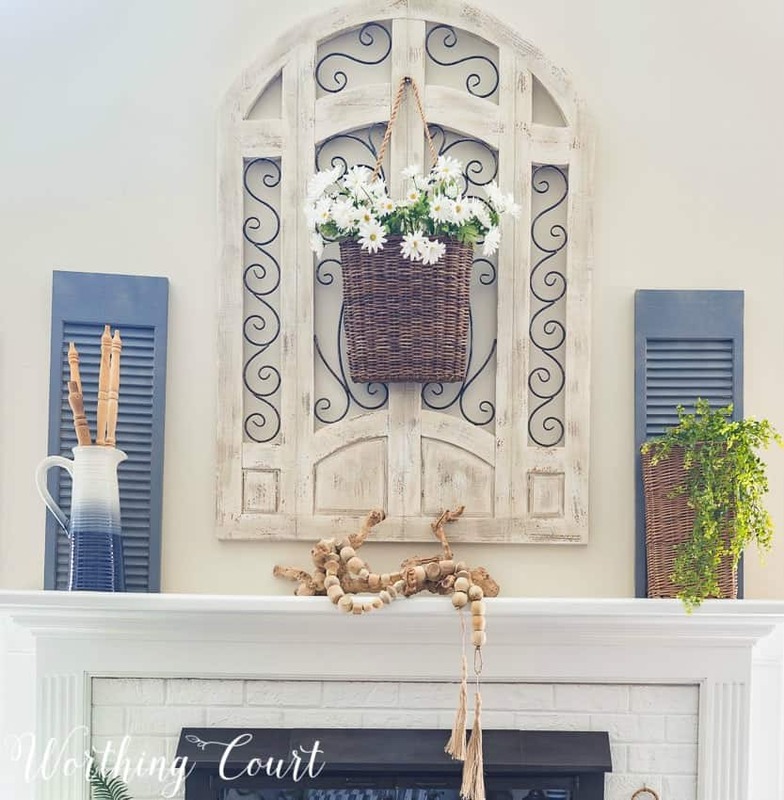 I have always loved blue and have used it in many of the rooms in my house.I have blue grey and white in our masterbath, blue and yellow in my guest bedroom and now I have added different shades of blue to my family room for summer. So calming and sets the stage for my shells,coral ,sea glass and other beachy decor items. A new rug and some throw pillows with my neutral furniture make the change easy. Blue is my favorite color. Thanks for all of your tips on adding blue in different ways all around the house. I have a slight bit of teal and light turquoise accent color in my great room and dining area so I don’t think blue will work. I am thinking about adding some lime green or bright yellow to give a fresh summery look. Any suggestions are welcome! Suzy, I enjoy Worthington Court so much. Not only do you apply common sense to beautiful design, but you also give us very affordable tips. We don’t need to have a million bucks to make it look like we do. I love the ideas – blue is my favourite colour and I will definitely use these tips and fresh up my space with some blue.